Besides many environmental benefits, this green roof and living wall effectively complement each other and embody the spirit of being eco-friendly and sustainable. Both the rooftop and third level broad-front façades of the new South Wing of the Temasek Polytechnic in Singapore are painted with a palette of living “green”. A 3480m2 green roof blankets almost its entire rooftop, whilst a 640m2 green wall decorates two broad-front façades at the third level of the building. 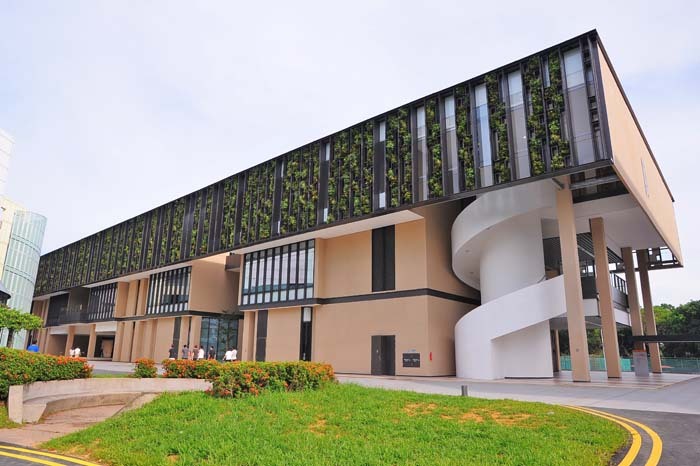 Elmich provides landscape engineering and architectural products and was the designer/manufacturer of the green wall and green roof systems for the new South Wing of Temasek Polytechnic in Singapore. The project was completed in 2012. Temasek Polytechnic has a 30-hectare campus and more than 1200 academic and administrative staff catering to approximately 15,000 full-time students. Reputed for its academic programs, applied research, managerial excellence and innovative corporate culture, the Polytechnic prepares school-leavers and working adults for a future of dynamic change, with relevant knowledge, life-long skills and values. Besides many environmental benefits, the green roof and living wall effectively complement each other and embodies the spirit of continuous effort by the Polytechnic to be eco-friendly and sustainable. They also serve as reminders to the Polytechnic’s student population of a need to be sensitive of their environment and encourage protection and preservation of the environment. Aesthetically pleasing, the refreshing green roof and façade walls provide a cooler and more conducive learning environment and reinforces the Polytechnic’s pledge to “bring education to life and life to education“. On the green roof, VersiCell® drainage cells were placed between the raised ridges of the metal corrugated roof to provide a level surface for the Elmich Green Roof system to be installed. The system includes VersiDrain 25P® drainage and water retention trays followed by a geotextile filter layer that allows EnviroMix® GR, a predominantly inorganic planting media, to be placed on top. Drought-tolerant plants (cyanotiscristata, zephyranthesrosea, sedum mexicanum, tradescantiapallida, wedeliatrilobata) were specially selected for planting. An automated irrigation system delivers water and nutrients at pre-determined times and durations to the green roof. 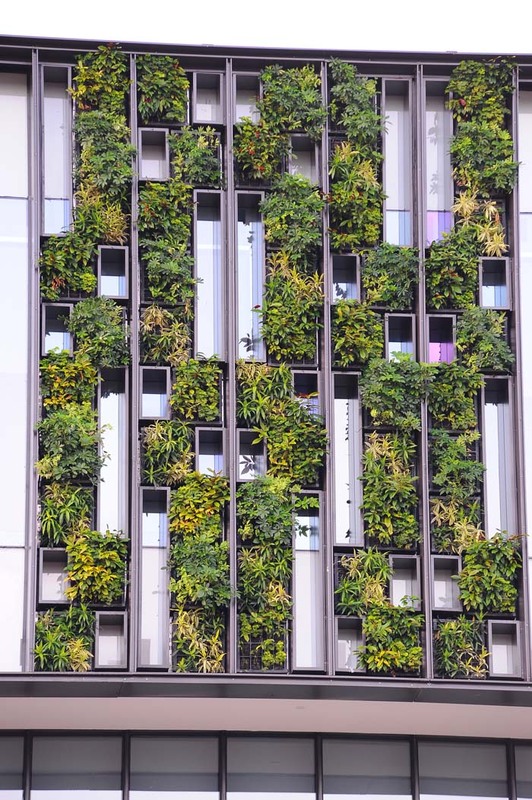 On the façades, the Elmich VGM® Green Wall system comprising of modular Vertical Greening Modules (VGM®) planting boxes, made from recycled materials, were pre-planted in a controlled nursery environment for the selected green wall plants (Pedilanthustithymaloides “variegated”, Exocaeriacochinensis, Polysciasfruticosa, Scheffleraarboricola “variegated”, Dracaena reflexa “green”, Dracaena reflexa “variegated”) to be established and vertically orientated before installation on-site. 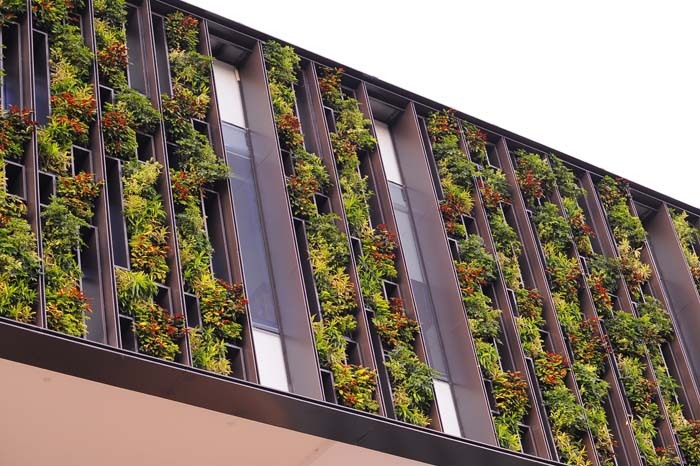 The versatile VGM® modular system, which also includes a stainless steel mounting system, allows attractive intricate patterns to be incorporated in the design of the living wall. Regular irrigation and supply of nutrients for selected durations at pre-determined times is delivered by an automated irrigation system. 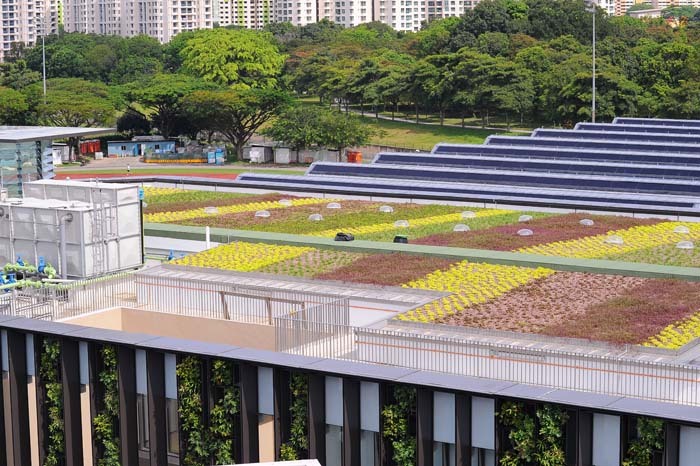 The installation of the living roof and living wall has helped the new South Wing of the Temasek Polytechnic to clinch the BCA Green Mark for Buildings (New Non-Residential Buildings) Platinum Award 2012.